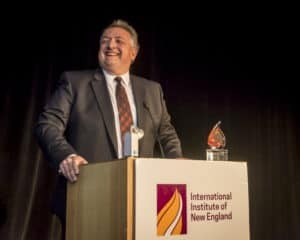 IINE hosted our 36th Golden Door Award gala in Boston on November 30, 2017. The 700-seat ballroom at the Intercontinental Hotel was filled to capacity with leaders from the life science industry and other IINE supporters who gathered to celebrate refugees and immigrants – and to pay tribute to one very special former refugee, Dr. Noubar Afeyan. Donations from corporate sponsors, individual supporters, including funds raised at the event itself, totaled $857,995 – our most successful fundraising gala ever. Our deepest gratitude to all those who attended, sponsored, and supported this remarkable event. The funds raised will directly support the services IINE provides refugees and immigrants over the course of the next year. In his remarks, IINE CEO Jeff Thielman noted that the path of Dr. Afeyan’s success has made him acutely aware of the struggles every immigrant encounters when they arrive in America. When business and innovation leaders recognize the extraordinary impact immigrants can have on our economy, everybody wins. “It is because of champions like Noubar that immigrants and refugees can succeed in New England,” he said. That was an idea echoed by the honoree himself when he addressed the room. When reflecting on the role immigrants play in the life sciences field, he said he believes that without immigration, innovation in this country will die. Dr. Afeyan spoke eloquently of his own background, his ties to his proud Armenian heritage, and his sense of obligation to be part of something personally meaningful outside of business. He advised those present to find a cause apart from their careers that inspires and sustains them as his work with the Aurora Humanitarian Initiative has done for him. The program for the evening also included heartfelt remarks by U.S. Congressman Joe Kennedy, written greetings from MIT President L. Rafael Reif and Vartan Gregorian, president of the Carnegie Corporation as well as a tribute from Stelios Papadopoulos, Chairman of the Board of Biogen.